So do you want to update Mi note 2 to android 7.0 nougat Miui 8 ? If yes then you are at right place . 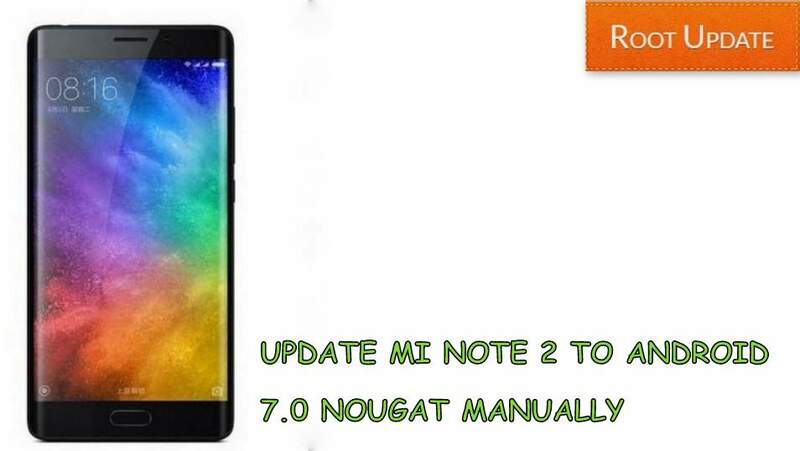 Today we are here with the guide On How to Update Xiaomi Mi note 2 to Android 7.0 Nougat . Mi Note 2 is the flagship device of xiaomi and it comes with a curved glass . The Smartphone came with Miui 8 based on Android marshmallow and now company has released android &.0 Nougat update for the Device. Xiaomi Mi note 2 comes with a 5.7 inch curved screen with a resolution of 1920X1080 and 386 Pixels per inch, Coming to the hardware of the device so there is a qulacomm snapdragon 821 processor coupled with 6Gb of ram and for better graphics there is Adreno 530 Gpu. So in this guide we will show you How to Update Mi note 2 to android 7.0 Nougat. So before you start installing Android 7.0 Nougat in your phone there are some points and Pre-requirements you have to follow and in addition we have also given some advantages and disadvantages you will get After you update your Xiaomi note 2 to android 7.0 nougat . Active internet connection is required to download the update. Now connect your computer to pc using a usb cable and transfer the Downloaded file in the root of Internal memory. Now you will see 4 different options out of which one is ” Choose Update package” . So this was our guide on How to Update Mi note 2 to Android 7.0 Nougat, We hope you liked this guide and if you have any doubt you can comment down below in the comments section.